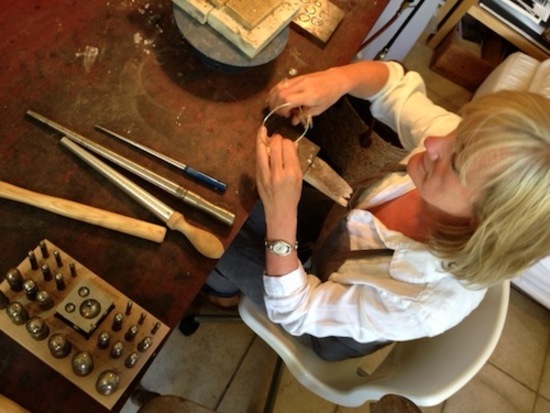 I'm a qualified jewellery designer, making my collections in my studio overlooking the beautiful city of Bath. My jewellery is fashion aware and therefore constantly evolving. Each piece is handmade by me for you, and is therefore unique. I work exclusively in precious metals. My jewellery is made using Sterling Silver, Vermeil, Rhodium Plated Silver, 9 carat and 18 carat Gold. I use traditional smithing techniques. My designs are simple and organic. My jewellery can be mixed and added to, allowing the wearer to build up a personal collection over time. Their timeless style makes them heirlooms of the future. My jewellery is perfect for celebrating the highlights of your life as well as the everyday. The Fran Regan Jewellery Wedding Collection consists of bespoke wedding rings and jewellery for brides and grooms, gifts for bridesmaids and cufflinks for the groom and his best man. Please contact me with any questions you have about my jewellery. International customers are responsible for all fees, taxes and duties payable within their country. Each item will be presentedin a black card gift box, wrapped in bubble wrap, paper or a bubble wrap envelope for safety. Refunds and exchanges are only offered on bespoke/custom purchases where the item has not been made to the correct specification as agreed between Fran and the client.